IPCC silently slashes its global warming predictions in the AR5 final draft | Watts Up With That? Unnoticed, the IPCC has slashed its global-warming predictions, implicitly rejecting the models on which it once so heavily and imprudently relied. In the second draft of the Fifth Assessment Report it had broadly agreed with the models that the world will warm by 0.4 to 1.0 Cº from 2016-2035 against 1986-2005. But in the final draft it quietly cut the 30-year projection to 0.3-0.7 Cº, saying the warming is more likely to be at the lower end of the range [equivalent to about 0.4 Cº over 30 years]. If that rate continued till 2100, global warming this century could be as little as 1.3 Cº. Official projections of global warming have plummeted since Dr. James Hansen of the Goddard Institute for Space Studies told the U.S. Congress in June 1988 the world would warm by 1 Cº every 20 years till 2050 (Fig. 1), implying 6 Cº to 2100. Figure 1. Projected global warming from 1988-2019 on three scenarios (above), and from 1988-2060 on scenario A only (below), based on Hansen (1988), who testified before the U.S. Congress that June that scenario A was his business-as-usual case. 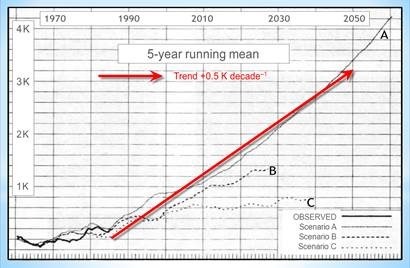 The trend from 1988-2050 on that scenario (arrowed) is approximately 0.5 Cº/decade. IPCC (1990: p. xi) projected warming of 0.2-0.5 Cº/decade to 2100. IPCC (1995: p. 6) projected 0.1-0.35 Cº/decade. IPCC (2001: p. 8) projected 0.13-0.43 Cº/decade to 2050. 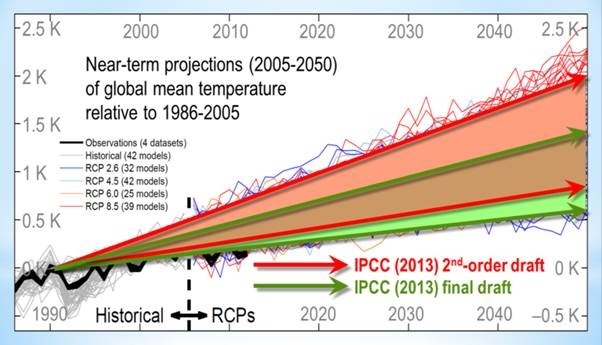 IPCC (2007: p. 13, table SPM.3) projected 0.11-0.64 Cº/decade to 2100. Figure 2. Near-term warming projections (2005-2050) relative to 1986-2005, based on 42 models (colors) against observations (black). The second-order draft of IPCC (2013) projected global warming at 0.4-1.0 Cº over 30 years (red arrows), equivalent to 0.13-0.33 Cº/decade. The final draft projected warming at 0.4-0.7 Cº over 30 years (green arrows), equivalent to just 0.10-0.23 Cº/decade. Diagram based on IPCC (2013, Fig. 11.25a). 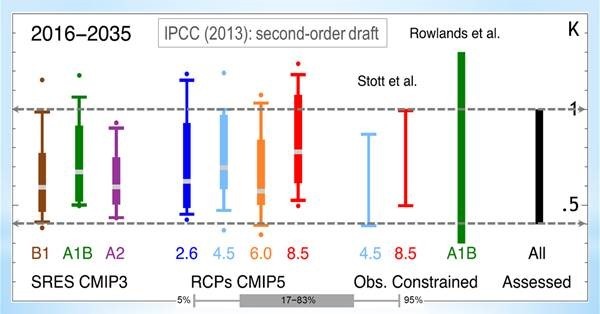 The second-order draft of IPCC (2013: fig. 11.33) had projected 0.13-0.33 Cº/decade to 2050. However, the final draft slashed this projection to 0.10-0.23 Cº/decade (Fig. 2), the IPCC’s best guess being closer to the lower than to the upper bound of the revised range. The projected range in the second-order draft had been consistent with the models, but the revised range in the final draft was at the low end of models’ projections (Fig. 3). Implicitly, the IPCC no longer accepts that models accurately project warming. “Overall, in the absence of major volcanic eruptions – which would cause significant but temporary cooling – and, assuming no significant future long term changes in solar irradiance, it is likely (>66% probability) that the GMST [global mean surface temperature] anomaly for the period 2016–2035, relative to the reference period of 1986–2005, will be in the range 0.3°C–0.7°C (expert assessment, to one significant figure; medium confidence).” (IPCC, 2013, p. 11-52). Figure 3. Above: Models’ global warming projections, 2016-2035 vs. 1986-2005, against the IPCC’s projected interval of 0.4-1.0 K over 30 years, equivalent to 0.13-0.33 K decade–1 (between the gray dotted lines, based on IPCC 2013, 2nd draft, fig. 11.33c). Below: Final draft’s revised interval of 0.3-0.7 K over 30 years or 0.10-2.33 K decade–1, visibly at the low end of models’ projections (based on IPCC, 2013, fig. 11.25c). This implicit rejection of the models’ forecasting skill has passed unnoticed until now. Reviewers of the second draft were not consulted about the change in the IPCC’s key near-term projections, though many had argued for it. The IPCC’s explicit reliance on its own “expert assessment” rather than upon the models’ projections is a significant climbdown. However, even its reduced best estimate of 0.13 Cº/decade may still be on the high side. Observed outturn since 1950 has been below 0.11 Cº/decade (HadCRUT4, 2013: Fig. 4). Figure 4. Global mean surface temperature anomalies and 0.11 Cº/decade least-squares trend, January 1950 to November 2013 (from HadCRUT4 data). That is not all. Despite record increases in CO2 concentration, there has been no global warming for almost 13 years (mean of GISS, HadCRUT4, NCDC, RSS, & UAH temperature data: Fig. 5), or, by satellite measurements, for more than 17 years (RSS, 2013: Fig. 6), and no warming distinguishable from the combined measurement, coverage, and bias uncertainties for 18 years (HadCRUT4, 2013: Fig. 7). Figure 5. Monthly global mean surface or lower-troposphere anomalies (dark blue) and least-squares linear-regression trend (bright blue: mean of GISS, HadCRUT4, NCDC, RSS, and UAH data), January 2001 to November 2013, showing no global warming for almost 13 years notwithstanding continuing rapid increases in atmospheric CO2 concentration (gray). Figure 6. Despite a near-linear increase of 2 μatm/year in CO2 concentration (NOAA, 2013, gray), the least-squares linear-regression trend (bright blue) on the RSS satellite monthly global mean lower-troposphere anomalies (dark blue) has been zero for 17 years 3 months (207 months). Figure 7. HadCRUT4 monthly global mean surface temperature anomalies and trend, February 1996 to November 2013, showing a linear trend entirely within and hence indistinguishable from the combined measurement, coverage, and bias uncertainties. In the light of the growing divergence between projection and observation, a direct comparison between the IPCC’s now-reduced near-term global warming projections and observed temperature change since 2005 is of value as a performance indicator for the models’ global-warming projections. Fig. 8 shows such a comparison, based on the downgraded projections in IPCC (2013, fig. 11.25a: see Fig. 2 above). In the nine years since 2005, a divergence of 0.15 Cº has occurred. Figure 8. Orange region: Models’ projections of global warming, January 2005 to November 2013, on the interval 1.33 [1.0, 2.33] Cº/century (from IPCC, 2013, fig. 11.25a). The second draft’s mid-range estimate is the final draft’s high-end estimate; the former low-end estimate is now the central estimate. Thick red trend-line: central projection of 0.12 K warming over the 107-month period, equivalent to 1.33 Cº/century. Gray curve and trend-line: monthly CO2 concentration anomalies (NOAA, 2013) and 18 μatm (198 μatm/century) trend, which caused 0.24 W m–2 forcing (or 0.35 W m–2 including other anthropogenic forcings). Of the 0.21 Cº warming projected to arise from this forcing, almost half was previously committed. Thick bright blue trend-line: Global cooling of 0.03 Cº (0.30 Cº/century: mean of five datasets). Over the period, the models over-predicted global warming by 0.15 Cº (1.6 Cº/century). Multiple lines of evidence now confirm that the models and consequently the IPCC have overestimated global warming. Yet neither that misconceived organization nor any of its host of unthinking devotees has displayed any remorse. Instead, they persist in maintaining that the warming is temporarily paused, though they cannot really explain why; or they blame particulate aerosols, their get-out-of-jail-free fudge-factor; or they pretend warming is really continuing unabated, saying it has gone into hiding deep in the oceans where, conveniently, we cannot measure it, or that the Earth-atmosphere system has a fever driven by four atom-bombs’-worth of heat content increase every second. What they are not prepared to countenance, notwithstanding the real-world, measured evidence, is the growing probability that they and their precious models have so badly misunderstood the climate, or so well understood it and so badly misrepresented it, that global warming is simply not going to occur at anything like any of the exaggerated rates that they had until now so confidently over-predicted. Do not underestimate the importance of the IPCC’s climbdown, albeit that it is furtive and that there is not a hint of it in the Summary for Policymakers – the only part of the latest assessment that lazy politicians and incurious journalists may ever get around to reading. If anyone ever again tries to tell you The Science Is Settled, as the now-axed Klimate Kommissariat in Australia is still trying to do in its latest taxpayer-funded propaganda sheet, point to Fig. 9 and ask two questions. First, point to the red zone marked Projections and ask which of the very wide range of official projections The Science has Settled upon. Secondly, point to the green zone marked Observations and ask why the real climate has so persistently failed to pay any attention to the Settled Science. Then sit back and listen to the increasingly demoralized and disjointed flannel. As the nonsense runs down, the game is up. GISS, 2013, Monthly global mean surface temperature anomalies, 1880-2013, from http://data.giss.nasa.gov/gistemp/tabledata_v3/GLB.Ts+dSST.txt. HadCRUT4, 2013, Monthly global mean surface temperature anomalies, from www.metoffice.gov.uk/hadobs/hadcrut4/data/current/time_series/HadCRUT.4.2.0.0.monthly_ns_avg.txt. Hansen, J., I., Fung, A. Lacis, D. Rind, S. Lebedeff, R. Ruedy, and G. Russell, 1988, Global climate changes as forecast by Goddard Institute for Space Studies Three-Dimensional Model. J. Geophys. Res. 93 (D8): 9341-9364. IPCC, 1990, Climate Change – The IPCC Assessment (1990): Report prepared for Intergovernmental Panel on Climate Change by Working Group I, J.T. Houghton, G.J. Jenkins and J.J. Ephraums (eds. ), Cambridge University Press, Cambridge, Great Britain, New York, NY, USA and Melbourne, Australia, 410 pp. IPCC, 1995, Climate Change 1995 – The Science of Climate Change: Contribution of WG1 to the Second Assessment Report, J.T. Houghton, L.G. Meira Filho, B.A. Callander, N. Harris, A. Kattenberg, and K. Maskell (eds. ), Cambridge University Press, Cambridge, Great Britain, New York, NY, USA and Melbourne, Australia. IPCC, 2001, Climate Change 2001: The Scientific Basis. Contribution of Working Group I to the Third Assessment Report of the Intergovernmental Panel on Climate Change [Houghton, J.T., Y. Ding, D.J. Griggs, M. Noguer, P.J. van der Linden, X. Dai, K. Maskell and C.A. Johnson (eds.)]. Cambridge University Press, Cambridge, United Kingdom, and New York, NY, USA, 881 pp. IPCC, 2007, Climate Change 2007: The Physical Science Basis. Contribution of Working Group I to the Fourth Assessment Report of the Intergovernmental Panel on Climate Change, 2007 [Solomon, S., D. Qin, M. Manning, Z. Chen, M. Marquis, K.B. Avery, M. Tignor and H.L. Miller (eds. )], Cambridge University Press, Cambridge, United Kingdom, and New York, NY, USA. IPCC, 2013, Climate Change 2013: The Physical Science Basis. Contribution of Working Group I to the Fifth Assessment Report of the Intergovernmental Panel on Climate Change [Stocker, T.F., D. Qin, G.-K Plattner, M. Tignor, S.K. Allen, J. Boschung, A. Nauels, Y. Xia, V. Bex, and P.M. Midgley (eds. )], Cambridge University Press, Cambridge, United Kingdom, and New York, NY, USA. NOAA, 2013, Monthly mean atmospheric CO2 concentration anomalies, 1958-2013, from ftp://ftp.cmdl.noaa.gov/ccg/co2/trends/co2_mm_mlo.txt. RSS, Inc., 2013, Global mean lower-troposphere temperature anomalies, 1979-2013, remss.com/data/msu/monthly_time_series/RSS_Monthly_MSU_AMSU_Channel_TLT_Anomalies_Land_and_Ocean_v03_3.txt. UAH, 2013, Satellite MSU monthly global mean lower-troposphere temperature anomalies: vortex.nsstc.uah.edu/data/msu/t2lt/uahncdc.lt. I generally tend to trust those recognized to be experts in their field, when they’re talking about their field, at least. But once these ‘experts’ have been caught out in lie after lie after lie, their credibility in my mind declines markedly. Thanks, Christopher. Happy New Year to you. T they are still expecting an increasing temperature. Does Christopher think that everything in a draft document should appear in the final report? Did they widen the error bars, or even discuss error and confidence? First they air brushed Michael Mann off the A list of experts and predictions and now Hansen, but the money still pulls them like an unseen force. Why does it bother you to see temperature trends vs CO2: actual, vs modeled? It doesn’t bother me, why do you think I am? Maybe I was mistaken. You seemed to be bothered. Let us hope that 2014 brings disinvestment to the worst offenders. We will be working toward that goal. It looks to me like the IPCC is taking a step back every time they have half a chance. Their GCMs were supposed to be so good that it was worth it to buy ever more powerful computers to run them. Now, not so much. Happy New Year and thanks for the good work in 2013. Billmelater. They have been “expecting” rising temps all along. It’s the lack of same that has wrong footed them. That and things like ice in Antartica. Think then write. Hear, hear, Christopher Monckton. Well done! Thank you for the truth-in-science tour de force. “Overall, … and, assuming … to one significant figure; medium confidence).” (IPCC, 2013, p. 11-52). Maria (disgustedly): What that supposed to mean? Fifty-fifty. Oh, I’m really going to go out there now and do what they say based on that — NOT. Joe (turns the channel): They must think we’re a bunch of morons. @ Billme — that’s okay, kid. It’s on the house. Thank you, Christopher Monckton, for your excellent work. Apparently even the IPCC doesn’t take the IPCC seriously either. Thanks very much. All good, and Figure 9 is a beautiful distillation of the argument. The Red Arrows of Fear, successively toppling toward the near-horizontal Green Lines of Fact, say it all. Happy New Year to you Lord Monckton and thanks for your efforts so far. Regarding the graphs I think that the easiest solution is for the IPCC to publish a graph in which ‘reality’ is just treated as an outlier and removed from an otherwise luverly graph. Cheer up chap, the game is not over. They still want your money and for you to live in energy poverty. They just can’t be honest about it. Where is the ‘final’ draft of the chapters? Which is this draft? Is this the one made available at the Stockholm WGI meeting in September? Can someone please clarify for those not paying attention. Also released at the time was the list of amendments to align with the agreed SPM (I can’t get to the ‘final’ draft nor this table of amendments right now). “anomaly for the period 2016–2035, relative to the reference period of 1986–2005, will be in the range 0.3°C–0.7°C “? If introduced into the ‘final’ draft circulated at Stockholm then I am surprised that it has only now been picked up. If introduced after Stockholm, then the question is: was it mentioned in the tabulation of amendments also released there? ….answering my own question. It was in the ‘final’ report as circulated at Stockholm (ch 11 p52). So this appears to be a significant change in the assessment projection that has been missed (?) by everyone until new. Wow. Now we need to create press releases to MSM and send it as actively as Greenpeace. This is just a good starting point. References must be exact and pointing to original sources. Copyrights must be absolutely clear. Bashing Hansen might give some pleasure but let’s leave that sandbox play and stick on the facts only. It will be easier to get published if we don’t emphasize that this means game over to the global warming agenda. Oh. So the data does matter after all? GlynnMhor says at 6:01 pm: I generally tend to trust those recognized to be experts in their field, when they’re talking about their field, at least. But once these ‘experts’ have been caught out in lie after lie after lie, their credibility in my mind declines markedly. The thing is that it’s not possible to disentangle the politics from the supposed science. And today, many leftist warmist pundits continue to insist that even if they are wrong on their theory, that what they propose what would “make the world better anyway.” No. WRONG. Take the absurdly high 83% CO2 cuts mandated in the 2009 cap & trade bill that passed the U.S. House. That bill would have taken an nearly apocalyptic wrecking ball to the economy and civil society. It wouldn’t have made “a better world.” Far from it. The scientists have been told to lie, starting with lead ipcc author Stephen Schneider in 1989 (“We have to offer up scary scenarios… each of us has to decide the right balance between being effective [lying] and being honest [ineffective]”). Over and over again the warmist scientists have idiotically expressed the view publicly that it’s good to deceive the public in order to advance “the cause.” There is just no way you can say that the “science” advanced by the suspect climate scientists, who have been told point blank that they should not be honest, there is no way that that science can be given ANY credibility. It is corrupted, tainted, worthless. Climate science is a crock. As a matter of fact any poll of the alleged consensus among scientists on climate change needs to exclude (post 1990 vintage) climate scientists because they cannot be considered politically unbiased or impartial. Re: “come full circle” (davidmhoffer) — “going in __(s)” is more likely, heh. Great quote! In a line: “Climate science is a crock.” (Eric Simpson!) Great post. Thanks for sharing. Once someone is known (here, as you point out, self-declared!) to be a l1ar, one cannot take ANY-thing they say seriously. troe:. They have been “expecting” rising temps all along. It’s the lack of same that has wrong footed them. That and things like ice in Antartica. Think then write. Troe, that is what they are expecting. What did you think they wee saying. I don’t understand your comment about Antarctic ice. Are you extrapolating what is happening in Antarctica to to the rest of them earth? If that is the case, can you also extrapolate what is happening in South Australia (top temp of 50 degrees centigrade) to the rest of the world as well? The final draft projected warming at 0.4-0.7 Cº over 30 years (green arrows), equivalent to just 0.10-0.23 Cº/decade. For the 0.10 to be correct, it has to be 0.3 and not 0.4 as stated higher up. What does this do to the C in CAGW? Without the C, is there any need for future conferences to cut down CO2 emissions? Maybe that is why they are now 95% confident over the 90% confidence in the last report. They are more confident of a lower number. I would be to! January 1, 2014 at 8:22 pm	…can you also extrapolate what is happening in South Australia (top temp of 50 degrees centigrade) to the rest of the world as well? Doesn’t the IPCC remind one of the Wherethefukrwee bird of the Central African savannas ? You know, the ‘long-necked’ one that flies in ever diminishing circles until eventually its head disappears into a dark orifice … at which time the plainted cry of ‘thewherethefukrwee’ is heard echoing across the plains. I got a bunch of quotes from these guys saying that they should make things up, such as Schneider saying they should “offer up scary scenarios” and find the balance between effectiveness and honesty. Of course, it implicitly clear that honesty is not effective. I get a sense that the words of Scneider and others has pervaded the body politic among climatologists. Understand that circa 1990 a boatload of cash flowed in to lavishly establish the newly reconfigured field of climatology. And the field of climatology was tasked not with finding out whether CO2 was causing dangerous warming, but with convincing the public of that. That was the mission. Convince the public, not of the truth, but of the “scary scenarios.” Modern climatology was given a public relations / marketing task from it’s ~ 1990 inception, and told to lie. There is no science there. None. It’s wall to wall bs meant to support their public relations mission. Janice, I think you’re going to be #1 next year when the annual report comes out! Of course, it’s not about quantity, but quality. But your quality never ceases to amuse amaze me. Actually, amaze and amuse! So when does the IPCC disband? They have met their mandate, the answer was no. Now they can slink off before the lynch mobs get angry enough to form. Fantastic post, Christopher, particularly those pointed two questions. Sharing. @ Gary Mount (re: 9:15pm, today): WAY — TO — GO! That little punk had that coming. @ Eric Simpson (smile) — thanks. Oh, brother. I am ACTUALLY (lol) going to try (ha, ha, ha) to post LESS this year. Meh, what-EVER, huh? I’ll just post as per usual (with a new power brake booster — hope it works, my mouth engine is a mighty one (an amazing one, heh, heh), Bwah, ha, ha, ha, haaa!). Say, Eric Simpson, just thought of an idea. If you could supply cites for each of those quotes, we WUWTers could copy that list and publish it in whatever venue our pocketbooks will allow (I’d buy an ad in the New York Times and billboards and metro bus ads, if I had the cash! ), even if it’s just a newsletter we have access to. Yes, yes, we can research those cites ourselves, too. If you haven’t the time — no problem. Your reference was referring to last year (it has gotten hotter since then). Warmists seem to have split into two unequal groups — the smaller group is trying to walk back previous predictions and the larger group has decided just to tell bigger lies. How long will good people of conscience allow these leftist loony looters to perpetuate this disconfirmed CAGW hypothesis. 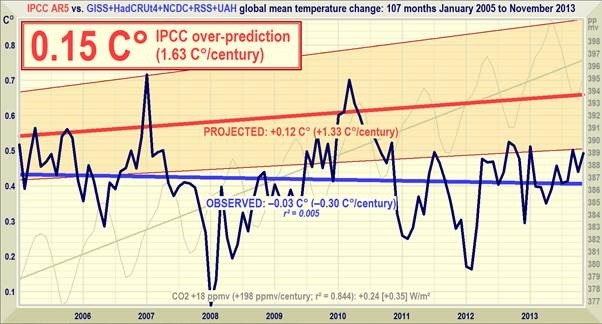 Even As climate sensitity projections continue being “revised” downward (now 1/10th~1/20th of original projections) these scoundrels have the audacity to keep repeating they’re tired and now despicable mantra of “it’s worse than we thought.” TM. How can revisions of 1/20th of original projections be “worse than we thought” TM? It defies logic, common sense and morality. Don’t think so. Garymount is less honest to refer to a year old article. Where as Billme was rounding up. The climate argument between believers and nonbelievers will still be happening when Mankind is wiped out by a very predictable cause. Clearly the year old article I reference shows hot temperatures have always occurred throughout Australian history. The Antarctic ice is a 30 year trend. I regret my earlier statement, I forgot to add stinkin and scoundrel. There is absolutely nothing unusual happening with regards to temperatures in northern SA, other than the hype the media are applying. And remember, at least one of those highs was recorded at an airport! Garymount. What is it with you that you have to start abusing people. Scared your arguments aren’t sound enough? What you are forgetting is that the BoM changed the way they measure temperatures using satellites covering areas that were never covered before. Also the BoM introduced 2 new “hot” colours last year which were removed because they were simply wrong. Still, I don’t see how the BoM can calculate a national average based on 112 ground based thermometers. That’s 1 device for every ~68,500 squre kilometers. There is nothing unusual about the current summer temperatures. So before calling people liars, you should do a little checking yourself. But the point stands, but raising the issue of ice in Antarctica (who would have thought that?) is a meaningless gesture as it means nothing. Then has the temerity to say think before you write. Pot Kettle Black? OK, folks, here’s something I don’t get in these graphs or some of the earlier ones. If there is a non-negative “anomaly” I’ve always understood it to mean that global warming is happening. Whether it is 0.001 degree or 0.1 degree or 0.9 degree or 2 degrees, it’s still “warming”. Of course, 3 degrees over 100 years has significantly different effects from 0.4 degree over 100 years; the former being only a little more than mildly annoying while the latter hardly noticeable. From what I recall my profs touting, it would take 4 to 6 degrees to even approach the mildest of the wild horrors of the warmist hysterics. So, why do all of the graphs seem to show some global warming over the last 17-18 years, when several postings have said that the data show no global warming over that period? I’m not trying to be annoying; I just don’t understand. Mib8 not sure myself. Someone told me there was a difference between heat and temperature. Some substance can gain heat and not increase temperature. Something called latent heat. Sounds weird but I suppose it can happen. IPCC has always worked on this obscure ‘show of hands’ / gut feeling method of assessment. That is subjective and open to criticism. Models have always been one of the elements influencing the expert opinion. It would seem that they are being given a lot less weight than before. That is as it _should be_ , it is not something with which to try to beat them over the head. His Lordship seems to be too accustomed to the yabooing of the british parliament where you lambaste your opponents for being wrong then lambaste them again, should they be foolish enough to change their minds and agree with you. The IPCC will have to do something close to a U-turn on the position they have been pedalling. In the interests of the rest of the planet that process should be made as easy and quick as possible. Trying to berate them every time they make the slightest concession to good sense and the facts is not going to help speed up that process. So this is what the IPCC are going to do to save face? They are going to downgrade their increase in global temperature projections to figures that are statistically insignificant, but they are still going to scare the wits out of anyone gullible enough to listen to them? Christopher, thank you for sharing this with us, have a very happy 2014! It has become quite obvious to me as of late that something much better than the current methods of information dissemination is required. So I am announcing today the project code-named Wattson : sub-core project Colossus. It’s the year 2020 and Mr. Forbin has just unboxed his new computer using Intel’s latest 5nm process node technology that went into full production just in the past year. Forbin recalls just 6 years earlier working on the Colossus project with his first generation i7 processor computer. The new computer fits in 169 times the number of transistors in the same space as that first generation version. But there’s more to that equation, as greater use of the 3 dimensional space is now used in present day processors. Then there’s the hybrid nature of this latest computer with 4 hybrid cores fitting in the space of one CPU class core. The sum results of all these advancements is a computer that executes code several thousand times faster than the computer Colossus Alpha first ran on. A supercomputer in a box, on my desk, thought Forbin, about time. Then there’s the additional computing power outside of the super-computer core processor, there’s the graphics/physics plug in cards. Now the desktop box is a super-computer on steroids. It is the hope that students and politicians, policy makers and…trolls will be using Wattson with their 4k monitors, in many cases 3 or more of them, to explore the latest science, with terabytes of data already deployed on the machines to investigate the claims of Pine beetle epidemics and albedo changes. This project is being announced 1 year ahead of schedule, so take that into consideration. I plan on a 10 part series to be published on WUWT sometime next year, with a final article where I turn things up to 11 and announce the code-named Wattson project : sub-core project Bastardi In A Box, in January 2016. Note, I wrote this up in a hurry to meet the midnight deadline so I could have this published Jan 1, 2014. Janice, for the sake of all of us here, don’t post less! And a huge thanks for replaying my quotes in a more prominent and attractive way. Excellent! And your idea of running the quotes like on the sides of buses and the NYT is outstanding. This could probably be done on the cheap. Also, possibly Google Adsense could be used to funnel interested people into a site of selected quotes. References would be good, and of course for the most part I haven’t bothered maintaining those links. Sure, anyone could google a bit of a quote to get to some links that will hopefully lead you to a more original source. A possible problem is that most sites limit the number of links you can include in a comment, or at least without going to moderation. Regardless, if we want to get serious about the quotes, links would be essential, so at some point I’ll try to find the time to find links for key quotes, and at times give the links. I’m thinking I wouldn’t provide the links most of the time though anyway just to keep things quick and simple. In my hurry I misnamed the first project, it’s supposed to be “Colossus-in-a-Box”. Where does this leave the predictions from Prof Sherwood announced in recent days ? First, Happy New Year to you and yours Bill ! I see you have not agreed to take me up on my BIGGER BET. To reiterate, here it is. If you prefer, we can make it a bet for $1. Your call Bill – it’s not about the money. Your article is about THE BET made in 1981 between Paul Ehrlich and Julian Simon. May I suggest that it is time for another BIGGER BET. Bill, I bet you $10,000 that the Global Average Lower Troposphere Temperature for December 2019 will be colder than Global Average Lower Troposphere Temperature for the current month of December 2013. The key to a good bet is that it is independently measurable. The Surface Temperature records are generally unreliable for many reasons. The Satellite Measurements of the Lower Troposphere are much more accurate. I have used UAH in my work so I propose that this be used in our BIGGER BET, but I am open to negotiation. Since you apparently believe the IPCC and its thousands of professional researchers, I suggest you should provide me with significant ODDS on our BET, but I am prepared to go even-odds if you wish. So what do you say Bill? Are you in and what are your proposed terms? I don’t want to be unfair Bill, so I will tell you now that I am confident I will win this bet, and I will win it with ease. Why? Because my predictive record is much better than that of the IPCC, as noted in my earlier posts. And in science, I suggest that one’s predictive track is perhaps the only objective measure of one’s competence. Martine Atherton of Brisbane promises a thorough debunking. I’ll be sure to pass it along here when she gets around to it. are you kidding me? I am on a phone right now but expect to get a thorough debunking when I get the chance. and temper your hyperbole. it will get you into all sorts of trouble. So sorry if that did not come through it was on NZ3 news Channel just a few minutes ago ( as reported in the …. you guessed it…. the GUa …. loud laughter prevents me from going further. Well done, Christopher, Lord Monckton!!! So pleased you continue to sound the alarm with solid facts about these snake oil salesmen and their ‘scientific’ lackeys. How anyone can allow themselves to spout such utter nonsense, for such shallow objectives, is beyond my ken. The problem here, of course, is that no one, not even one climate cognoscenti, provides even a single nod that, as of today, the Holocene interglacial is now 11,717 years old…..
That’s two centuries or so beyond half the present precession cycle (or 23,000/2=11,500). Only one interglacial (that would be MIS-11) since the Mid-Pleistocene Transition (MPT) has lasted longer than about half a precession cycle. If the Holocene is supposed to last longer than about half a precession cycle (which it has by a few centuries now) doesn’t this at least deserve an honorable mention? Not in any UN-IPCC Assessment Report. The Holocene (MIS-1) will “go-long”, like MIS-11 did, or it won’t. If it doesn’t, how do you propose to recognize whatever UN-IPCC, Gorical etc. from the “The pronounced climate and environment instability during the interglacial/glacial transition could be consistent with the assumption that it is about a natural phenomenon, characteristic for transitional stages.”? MIS-5e, the Eemian, went down into the Wisconsin glacial after at least 2 strong thermal pulses right at its very end! It doesn’t really matter when the Holocene ends, now, or however many half or full precession cycles that may be. The Eemian went thermally ballistic, not once, but twice,during its last thousand years or so. I either need to see a basic average sea level rise between +6 to +45M amsl during the end Holocene ( http://business.uow.edu.au/sydney-bschool/content/groups/public/@web/@sci/@eesc/documents/doc/uow045009.pdf or greater than +52m amsl http://lin.irk.ru/pdf/6696.pdf before ANY prognostication can be considered anomalous. P.S. Anthropogenic warmIstas: you need to UP your game. To even be considered anomalous you need to be, at the very least, twice background……. Got it? P.P.S. Background. The single largest question that simply MUST be answered is just what is climate background at a greater than half a precession-old extreme interglacial? Billyoulots has successfully hijacked the thread. Bill seems to want to talk about something in Australia that has happened before that has no significance globally (if at all). The IPCC changed its report after the Big Headline news releases, its not as bad as they thought after all. Now this has significance because of the lies and deceit of the IPCC. How is publishing a moderate change to predictions in an international report either ‘silent’ or ‘slashing’ ? Science evolves as additional data becomes available. Nothing controversial about that I’m afraid. Gary, I can’t help but notice that these adjustments are ever in the direction I predicted over a decade ago when I realised how weak the so-called “Settled Science” is and how natural climate-change factors dominate in the system. @Chris: The rate of change is still a hotly debated topic with many climate scientists leaning on the conservative side. This is not controversial. This is also a different discussion to the tabloids on skeptic blogs such as WUWT, which pretty much aim to discredit the field entirely. Gary, you are wrong (nor was your sly reference of “to the tabloids on …” missed). “While a preliminary leaked draft showed even more major climb-downs that the politicians and bureaucrats went on to squelch and obfuscate, the fact of the matter is that the final draft of the International Panel on Climate Change’s Annual Assessment Report 5 shows a major climb-down on what matters: global warming. “In short, as it has been doing for a decade, the state of the art in climate science is moving in the direction I have been saying all along. The AGW theory was mostly wrong, because while CO2 is, in fact, a greenhouse gas, they overestimated the amplification feedbacks. … that CO2 is a greenhouse gas, albeit one with potential benefits, including a slightly warmer average temperature and greater crop and other green-plant production as CO2 is integrally bound up in photosynthesis. We are not determined to “discredit the field entirely”, we want to get the science right. I.e., in accord with nature. As it turns out, we are far more right than wrong about the feedbacks, which the IPCC and most climate scientists grossly overestimated. They use scare tactics to rile the public up to political action that just so happens to be give them more money and power. However, natural factors easily swamp man’s puny contributions. If it was otherwise, that would be fine, and I and WUWT and others would gladly acknowledge it. Anthony Watts in particular is an environmentalist and conversationalist. He, myself, JoAnne Nova, and most other skeptics that I know bought into the alarmist hypothesis once upon a time. Anthony Watts was particularly invested in it. Your allegation that we are interested in a foregone conclusion rather than following the facts where they lead is false — certainly it is in my case. … for your consideration, information, or bemusement. It is worth noting that the rise in temperatures has never been considered catastrophic or even problematic. It is the rate of rise in temperatures that was potentially disastrous. So when does the expected change become so slow that we can adapt easily? Probably when the effects of warming are slower than the natural wear-and-tear on infrastructure; we will adapt at no extra cost then. Have we hit that point? When did Adriana say that? What date was she referring to? So far they are only projections. 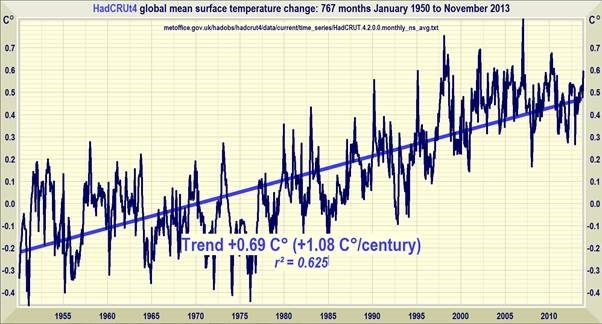 If we have no data from thermometers, in areas where there are none, or none in regular use, with which to compare- how can we say these temperatures are unprecedented? Did Dear leader of the ship of fools get his weather forecast from BOM? Was he also promised record heat? Might explain the Polar Star’s request for a weather forecast from the private sector. Again models? Using models in state of real time adjusted data? I wonder how much the data must be adjusted to get the IPCC lower predictions. When I see the figures like nr 9 I get a strange feeling of somehow someone is still missing something. We have models, HadCRUT4 and then comes RSS. I didn’t at first know what I was missing but then I remember an picture of the route the RSS satellites travel. Back in time when I look t at the picture for me it was nice but no more then that. Now I cant find it any more but it look t like the planet whit an satellite covering it showing yellow. And two parts not covert being gray. And guess what? Yes the not covert areas where the poles. So even RSS is not showing all of the planet and letting out important cool data. So the temperature in real time is still lower. Then there was the news (no lost that one to) that there would be a new satellite going to masseur data. And that this satellite has an build in correction up to mead global warming stander ts. So if true even RSS is off whit the data to the warm site. To make figure 9 complete you should put in 1 more set. Only than you cane see what is happening. This is the part thart most concerns me. We plebs have little to no access to the elite folk who actually run our society, and so have little chance of changing anything. But I wonder if Christopher Monckton of Brenchley still has personal connnections with those in power, particularly in the old-school wing of the Conservative party in the UK. Christopher, I hope you do apply whatever private pressure you can to correct much of the misinformation being fed to our government from the IPCC and it’s clones. I made a point of saying that I’d post her follow-up here because I imagined it would be lame. She did not disappoint! @Mib8, no for “warming” to be occurring, the anomaly would have to be getting bigger. Unfortunately for the warmies, the anomaly has been falling this century, indicating 21st century cooling. Like the minute of your business meetings, council meetings, etc The IPCC summary for Pols MUST reflect precisely the document, meeting, as written. It should not be almost the exact opposite. This is a legal requirement in all speres of public business. Oh we have a new member of he august society of misplaced thermometers. Great work, Christopher – a promising start to 2014. “SPM.2 (Note (c)) reveals that the “assessed range for near-term (2016-2035) temperature change” (ie final projections) “is lower than the 5-95% model range”. This obscure comment is the sole SPM disclosure that all of the CMIP5 near-term projections were downscaled by an arbitrary 20% at the Stockholm meeting. This was necessary to belatedly recognise that many of the models are “running hot” and are wholly incompatible with temperature realities. This band-aid was neither scientific nor rational. When certain models are wildly astray, the only acceptable procedure is to isolate all ensembles affected by their outputs and to require the culprits to be adjusted. If they remain unable to hindcast ‘the real world’, they must obviously be set aside. A last-minute curve-correcting discount of all model outputs for a limited and arbitrary period inevitably smacks of panic. The unapologetic ad hockery of this intervention undermines the plausibilty of all AR5 projections. The sudden necessity of a 20% discount seriously impeaches the SPM assertion that past attribution certainty has increased to a 95% level. Such alleged certainty contrasts with confidence in the mid-term (2046-65) future projections being marked down to “medium” – meaning about a 50:50 chance of being correct, or ‘as likely as not’ to be wrong. This is markedly lower than any previous IPCC projections. The confidence markdown was made because there is “insufficient scientific understanding” whether “the factors” that caused the 20% discount of near-term projections, might also apply to the mid-term . “ROSES and REACTS: Former prime minister Jens Stoltenberg reacts when prime minister Erna Solberg chose not to mention environmental and climate politics in her first new year’s speech. Stoltenberg got the UN top job which we have foreseen for years, as he has given away Norwegian money to all kinds of UN projects and initiatives. It must be mentioned that he is still in a full job as an elected representative in the Norwegian government, but that does obviously not hinder him in doing another full-time job for the UN. Luckily for us, it means that he will probably perform two jobs badly instead of one of them well. There is absolutely nothing unusual happening with regards to temperatures in northern SA…. Yes, I am sure records are the same: Australian temperature records shoddy, inaccurate, unreliable. ….So, why do all of the graphs seem to show some global warming over the last 17-18 years, when several postings have said that the data show no global warming over that period? I’m not trying to be annoying; I just don’t understand. First there are several different data sets. Second it is all about the statements made by Warmists. So the falsification criteria is 15 years to 17 years. That is why we start at the present and count backwards. Once we hit 17 years The Goose is Cooked. Unfortunately the Goose seems to be a zombie and keeps rising from the dead. Do not forget this is “Statistically Significant” warming. The discernment has to be a trend different from zero at 95% confidence because that is the confidence level used by ‘climate science’. All the available time series of global temperature show no discernible global warming or show global cooling at 95% confidence for at least 17 years. RSS shows no discernible global warming or global cooling at 95% confidence for 22 years. If this is just the “final draft” it will be interesting to see what the actual report says when it is finally published. Don’t hold your breath for the MSM to report anything, though. A number of posters have been having a go at me about the high temperature in South Australia. I did so in response to another poster. Surely that is ok isn’t it? Roy of uk, I mentioned South Australia being very hot (not unprecedented as some one claimed). You make a charge that I am hijacking the thread. Yet when tuer mentioned ice in Antarctica to which I was responding, you don’t say anything. Why is that? Anything cool is ok, anything hot not? Remember this is a science blog, and discussion of ideas is paramount. Abuse and attempts to censure posters should not be tolerated. Then again if it is a blog of vindictIve know nothings that cannot stand other people expressing a view, then keep up the good work. You forgot the rest of it. John Leon Skepticalscience? the treehouse kids? Ha Ha Ha Ha! Way to go for 2014……. Gail, that report you referred to was for measurement taken before 1972. I was referring to a reading of 54 degrees taken recently. But although it is hot, I won’t verify the accuracy as it was a private thermometer. The point I was making that referring to ice in Antarctica is nonsensical to indicate the Earth is cooling. Got an infra red thermometer for Christmas. Global Warming solved.- It’s all down to cloud height. The temperature reflected back from clouds depends on their height. Minutes of meetings etc are different from draft reports. If the final report had to reflect the draft exactly, then the draft is the final report. You know it makes sense! Yes, it is the pronounced climate and environment instability during the interglacial/glacial transition that has me worried. If Dr. Brown (Duke Univ.) is correct and the climate is chaotic with two strange attractors, Warm and Cold, then the Holocene is sitting on the edge of the transition between them and it may not even matter if we do not go into glaciation. The wild ride as the climate becomes unstable will be bad enough. That is the big question of course. What is the threshold conditions needed to push us into the next glaciation or climate instability? Catastrophic Global Warming is completely off the table for the next 4,000 years even in the best case scenario, “..Insolation will remain at this level slightly above the inception for the next 4,000 years before it then increases again.” except as spikes caused by the chaotic climate’s instability. Hot, Cold, Ice, Floods, famine, pestilence, plague and even Zits have been blamed on Global warming. So I don’t care about you being off track again. Try answer the question or at least post something to do with the Main article. So I will try again Bill. What do you think about the IPCC issuing a draft report and untold press releases telling us what a huge and devastating problem global warming is. And then changing the draft a few months later, with no press releases, so its not actually “worse than we thought.”. Come on now I am sure I have put it quite simply for you so an answer would be appreciated. Roy UK, fair question. My position that if anyone deliberately misleads the public with false or distorted data or interpretation of same should be treated with the full force of the law and given the maximum sentences possible. This is a crime against humanity. Misleading the public has real financial consequences. For instance, my insurance premiums have gone up by 25% two years ago and another 20% last year. When I inquired as to why, the insurance company responded that it was due to high number of claims made due to climate related damage to property. If the IPCC have conclude that the climate is changing they should be using every means that their disposal to get the message out so that action can commence to lessen the impact. If their analysis shows there is no change in climate expected then they are acting appropriately and the insurance companies are ripping people off. Figure 9 completely falsifies the CAGW hypthesis by itself. Models are NOT experiment, nor do they create real experimental data. They are only a model of a variant of the hypothesis and NOT models of the real actual climate. ALL they can do is create projected data of what the hypothesis predicts. This then must be compared to the real, observed, empirically measured data. Figure 9 clearly shows that the prediction of the hypothesis is NOT supported by the observation and so…. Science 101 dictates that the hypothesis be rejected or amended until it can match observed reality. All that can be stated for certain at this stage is that there has been approximately 1 3rd of the predicted warming occur. NOTHING MORE. We do not know why there has been less warming than predicted, and many of the alarmists refuse to even countenance that reality at all, so until they do accept that and research why, there is no way to know if ANY of the warming is man-made or not, or if we really should have had more warming or if we should have had less. ALL we know for certain is that the there has been 1 3rd of the predicted warming and that the models are wrong and we don’t know jack about what will REALLY happen to the climate in the future. Every other assertion is nothing more than unvalidated hypothesis at this point. to compensate for the AAE Antarctic fiasco, which Australian media virtually ignored, & never explained when they did mentiion it, our media have been on a binge of HOT stories. Are the insurance companies actually having an increase in claims due to weather related damage? In which case they need to alter their actuaries and determine the actual level of risk associated with increased weather damage, whether this is caused by human induced, or entirely natural climate change, is irrelevant. The fact is the climate changes all the time, weather changes all the time. there are weather related claims being made all the time and the insurance companies base financial risk on reality, not on hypotheticals. I do not believe that insurance companies are basing risk on the IPCC report, but are basing it on what actually happens in the real world. There has been a large increase in flooding through 2012 as the excessively wet conditions, allied with poor flood defences in some locations, increased building on flood plains and poorly maintained drainage ditches all combined to increase the number of floods and losses associated therein. Then in early 2013 there was record snowfall in some areas. Insurance companies are recouping their losses based on actual claims made. There is no doubt that there has been an increase in weather related claims. This proves nothing about man-made climate change however, but it does allow insurance companies to use the fact of increased claims, alongside the PR (propaganda) of climate alarm, to sell the increase in premiums to a largely mislead (by the mainstream media and especially the BBC) public. my comment re australian media in hot pursuit of hotspots (compensating for the AAE Antarctic fiasco) is in moderation, but this is the 80 degree excerpt i meant to include with this link. How can something be “quietly cut” when it was only a draft in the first place? Monckton makes it sound like the IPCC noisily made some predictions, and then secretly changed them afterwards, but this is the exact opposite of what really happened. The Second Order Draft was, as the name suggests, a draft. The IPCC specifically says that the earlier drafts are just preliminary, not the final conclusions, and indeed it asked authors and reviewers not to circulate the drafts specifically because it didn’t want people thinking that the draft conclusions were the final ones. The drafts will be officially published later as a matter of public record, along with the review comments and author responses, so the evolution of the report will be clear. This is a totally manufactured criticism. Richard Betts, I politely disagree. For sure, drafts are drafts and it is not surprising that they change before final publication. And of course the trend in expected impact of CO2 will be downwards, ever downwards, as the planet continues to ignore the rise in CO2. I do agree that there is nothing to criticise there. That is what is happening, the drafts should change with more observations. The constant crushing of alarmism by the relentless hammer of reality is not publicised. It ought to be the headline of the SFPM. It ought to have an IPCC press conference. It ought to be in school curriculums as an example of the scientific process. But no; drafts just eke out, one by one, shaving a bit off here, a bit off there and is no-one meant to notice? If Rodin did this with his sculpting the Thinker would be transgendered by now. …The point I was making that referring to ice in Antarctica is nonsensical to indicate the Earth is cooling. Alright I will be more serious. The accuracy of the Australia and New Zealand temp record has been under fire for a while. There are several threads on the subject at various blogs like The Goat Ate the Data and Announcing a formal request for the Auditor General to audit the Australian BOM for example. As William McClenney and I keep pointing out we are just beyond half the present precession cycle and that may indicate the end of this interglacial. The latest paper, that William discussed here on WUWT was Can we predict the duration of an interglacial? So what is this critical bipolar seesaw? Understanding the phase relationship between climate changes in the Arctic and Antarctic regions is essential for our understanding of the dynamics of the Earth’s climate system. In this paper we show that the 20th century de-trended Arctic and Antarctic temperatures vary in anti-phase seesaw pattern – when the Arctic warms the Antarctica cools and visa versa. This is the first time that a bi-polar seesaw pattern has been identified in the 20th century Arctic and Antarctic temperature records…. …To the specific point of open Arctic waters being a heat loss area from the earth. Notice that we are assuming far-north openings here, not a theoretical physics textbook ice mass of theoretical albedo = .95 floating off the ice-filled (Equatorial) waters of Polynesia where the sun is directly overhead (Air Mass = 1.0) with perfectly clear skies and no humidity. But this little bit of remaining 3.5 Mkm^2 Arctic sea ice is actually in the water up between latitude 78 north to 83 north. At that latitude, in mid and late September when arctic sea ice is at its minimum extents, there is MORE heat lost from open waters due to more evaporation losses, more conduction losses, more convective losses, and more radiation losses from open sea water than can be gained from that exposed water getting heated by the ever-lower sun angles! At those latitudes, at that time of year, the HIGHEST the sun can get is 8 – 12 degrees above the horizon, air masses are 18 to 34. There simply is no solar heat penetrating the atmosphere at those low solar angles to be gained if the Arctic ice continues to melt. The more the Arctic sea ice melts from today’s minimum extents in August and September, the more the planet loses heat energy to space and cools down ever more.…. But it is worse than you think! At today’s levels of BOTH minimum AND maximum extent in the Antarctic seas, today’s (and last year’s!) record breaking sea ice extents DO reflect much more solar energy than the exposed waters! At the edge of the Antarctic sea ice at 60 – 70 south latitude, ALL YEAR, every day, the record-breaking Antarctic sea ice extents IS reflecting MORE solar energy and IS cooling the planet down even more. And thus we slide quickly into the next major ice age. So whether sea ice prevents heat loss or causes solar energy reflection for a NET ENERGY LOSS is completely dependent on the angle of the sun which is quite different for the Arctic Sea vs the Antarctic Continent and surrounding sea ice. This is why what is happening in the Antarctic is so critical. There is also Drakes Passage. See Effect of Drake Passage on the global thermohaline circulation and think about what ice blocking or restricting the area would mean…. If Antarctic sea ice continues to grow at the present rate we may find out exactly what it means the hard way. OH, and speaking of weather, we broke records for low temperatures in my area BRRrrr. …Minutes of meetings etc are different from draft reports. If the final report had to reflect the draft exactly, then the draft is the final report. You know it makes sense! The Draft report was the FINAL report from the SCIENTISTS. The Summary for Policy Makers(SPM) is the results of a meeting from a bunch of POLITICIANS and BUREAUCRATS. The report from the scientists is then twisted until it supports The Summary for Policy Makers and becomes the Final Report. And that is a calibrated “gauge”, right? No where is Australia by official stations have reordered temperatures anywhere near 54c. The last graphic says it all. What if we get a decade of more cooling (without volcanic forcing), what then? How will the graphic look like? 🙂 Only then will they admit that the science is really not settled? Or maybe not. I wouldn’t put it past the IPCC to suddenly announce that it had been wrong all along and that increasing atmospheric CO2 concentrations causes global cooling. All it would take would be just changing the signs of a few variables in their models and quickly readjusting historical global temperature data to show it was warmer in the past. Given the propensity for the majority of individuals to not remember what happened decades ago and believe what authority figures tell them, likely such a preposterous scheme would be noticed only by those who are suspicious by nature and question authority. With a mere flip of the presumed effects of CO2 on world temperature, suddenly the models would fit far better and would predict a new ice age in a century. The only question is whether people would accept the huge reductions in fossil fuel consumption which would be imperative to prevent the next ice age according to “experts”? While such a reversal of the IPCC’s position might seem far fetched, it is more plausible than Trenbeth’s “missing heat” and it appears that no theory is too implausible for this group of kleptocrats if it furthers the watermelon agenda of a deindustrialized world. Sydney-based expedition spokesman, Alvin Stone, says the group is relieved. “Aside from the packing madness, I think there’s quite a bit of joy through the ship at the fact that it’s finally coming,” he said. “I think it was at that point where people were getting frustrated with what was going on. Nature showed Steven Sherwood’s affiliations as including CCRC/UNSW, which has Chris Turney on the Team, but MSM only mentioned Sherwood’s affiliation to the ARC Centre of Excellence for Climate System Science, in which UNSW is just part of a consortium. My estimates for global warming at the maximum rate will be 0.85c by 2100. That is global warming roughly 0.1c per decade, but for 30 years in the near future don’t see any warming. Therefore at most 0.1c per decade global temperatures will have risen by 0.55c by 2100. Why is this value even too high? The theory behind a doubling of CO2 leads to 1c warming, any more relies on positive feedback’s. Global water vapor has been declining overall during recent decades (especially at high levels) so the link between CO2 and positive feedback regarding water vapor is absent. Naturally if more global low cloud increases this is a positive feedback in the cooling direction, so the feedback to doubling CO2 still shows to be in the cooling region. Therefore 1c per doubling of CO2 is still too high taking into feedback’s that represent cooling. This is where the 0.55c by 2100 becomes half that and therefore 0.275c warming by 2100 not starting until to at least 2044, will hardly be noticeable on a global level. CAGW has finally come to end regarding scientific evidence, but politically the desperation will continue. What if the suns solar activity significant declines over the next decades and that the 0.275c warming could easily become a negative one by 2100. Several of your comments drew out the snarkiness in myself and a few others, though I had not posted yet. Many have been following this AR5 for several months, this is the first actual change, and it is in the opposite direction that the IPCC has been digging in its heels about for years. As regards your statement above, that made me realize you have a mind and there is an opening to it. Temperature does not measure the actual heat in a system. Think about a 40°C day. Is it more comfortable at 10 %RH or 90 %RH. Even though the temperature is the same, the air with the higher %RH has more actual heat, or enthalpy. In order to tell if the world is warming the temperature needs to go up with the same or higher humidity, but we don’t really have the measurements to tell if the fraction of a 1°C warming we have seen so far actually means it has warmed. Considering that humidity seems to be decreasing, the whole warming concept becomes tenuous at best, let alone catastrophic. Oh dear! You have completely missed a very major point of the article by Lord Monckton. You have not merely underestimated the importance of the point: you have ignored it completely. And what the IPCC has done is sneaky in the extreme. It is the custom and practice of the IPCC for all of its Reports to be amended to agree with the political summaries. The facts are as follows. We can rely on the Authors to ensure the Report agrees with the Summary. This custom and practice enabled the infamous ‘Chapter 8′ scandal so perhaps it should – at long last – be changed. However, it has been adopted as official IPCC procedure for all subsequent IPCC Reports. Appendix A of the present Report (the AR5 which is under discussion here) states this where it says. This is completely in accord with the official purpose of the IPCC. The IPCC does NOT exist to summarise climate science and it does not. The IPCC is only permitted to say AGW is a significant problem because they are tasked to accept that there is a “risk of human-induced climate change” which requires “options for adaptation and mitigation” that can be selected as political polices and the IPCC is tasked to provide those “options”. (b) “options for adaptation and mitigation” which pertain to “the application of particular policies”. Hence, its “Role” demands that the IPCC accepts as a given that there is a “risk of human-induced climate change” which requires “options for adaptation and mitigation” which pertain to “the application of particular policies”. Any ‘science’ which fails to support that political purpose is ‘amended’ in furtherance of the IPCC’s Role. This is achieved by amendment of the IPCC’s so-called ‘scientific’ Reports to fulfil the IPCC’s political purpose by politicians approving the SPM then the IPCC lead Authors amending the so-called ‘scientific’ Reports to agree with the SPM. All IPCC Reports including the IPCC AR5 are pure pseudoscience intended to provide information to justify political actions; i.e.Lysenkoism. That is bad enough. But what Lord Monckton reports above compounds the pseudoscience. People only read the SPMs because the so-called ‘science’ Reports are amended to agree with the SPMs. This practice is in accord with the practice and procedures specified in the IPCC’s own documents. But in this case – as Lord Monckton points out – the so-called ‘science’ Report has been amended to DISagree with the SPM. Couple of things to keep in mind. 1)A trend is only meaningful if it is within the bounds of the mechanism causing the trend. Look at the following graph. As you can see the trend shows warming and then cooling if you break at the approximate position the PDO changed from its warm mode to its cool mode (2005). Now, you can create trends across this boundary that show warming or cooling. And, that is what many people do. 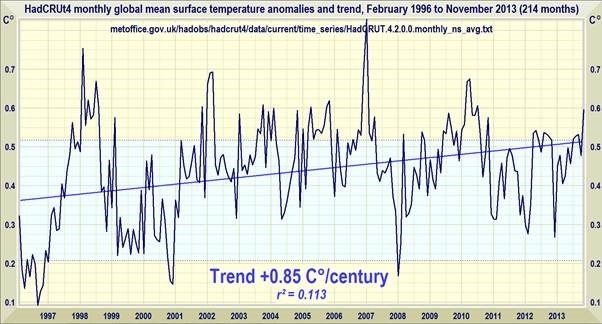 For example, if you start in 2001 you will still see a cooling trend to the end, but if you start in 1990 you will see a warming trend. 2) There are different data sets based on different data capture technologies. The only good ones are satellites but they only go back 35 years. I would avoid any of the other data sets when measuring anything within the last 35 years. As for the IPCC I think they might have the numerical value pretty close, they just have the sign wrong. Christopher can speak for himself, but the reasonably knowledgeable & curious observer would want to know the scientific justification for a material change to “settled science”. You should, too. I write to respectfully dispute an argument in your post at January 2, 2014 at 6:57 am. Your point is not relevant to the important question as to how long there has been no discernible global warming. The answer to that question has to be obtained by back in time from now. So-called ‘climate science’ uses linear trends and applies 95% confidence. There are good reasons to dispute the adoption of linear trends (and your point about PDO modes does dispute the applicability of linear trends) and to dispute the use of 95% as appropriate confidence. But so-called ‘climate science’ does use linear trends and does apply 95% confidence so those are the conventions which are appropriate to use in this case. 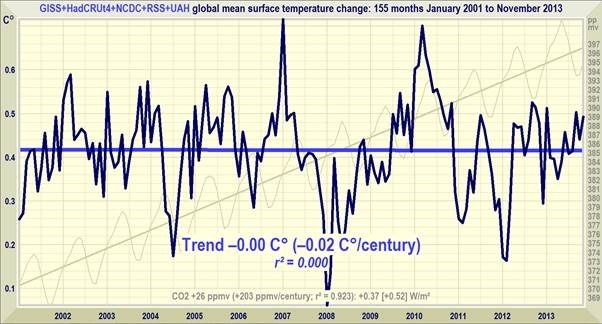 Starting from now and working back in time one discovers that each of the data sets of global temperature shows a linear trend which cannot be discerned as being different from zero at 95% confidence for at least 17 years (RSS says 22 years). In other words, when the criteria set by so-called ‘climate science’ are used then the available data sets each indicates there has been no discernible global warming or global cooling trend for at least 17 years. And this is why even the IPCC admits that there is a “pause” in global warming. However, in reality it cannot be known if global warming will resume (so has “paused”) or if global cooling will occur in future. All that can be said with certainty is that a discernible trend of global warming has stopped. While such a reversal of the IPCC’s position might seem far fetched, it is more plausible than Trenbeth’s “missing heat” and it appears that no theory is too implausible for this group of kleptocrats if it furthers the watermelon agenda of a deindustrialized world. The problem is although the 1970’s “Cooling Scare’ died the Anti-Growth Malthusianism typified by that book did not. The perspective is still very much alive and well in Obama’s Science Czar, John Holdren, who now wants to use “free-markets” (WTO??) to achieve his original goal. Heck he even has a really weird definition of ‘Human’ and I doubt many here at WUWT meet it. This can also be seen in this statement by Dr. Ezekiel J. Emanuel, a bioethicist and architect of President Obama’s health care law. These bits and pieces that indicate that world leaders view us as less than ‘human’ and may therefore have plans for wiping out large numbers of people if the feel it necessary. …the improving knowledge of glacial history, and especially the apparent brevity of warm interglacials, prompted anxiety about a full-blown ice age. George Kukla, together with Robert Matthews of Brown University, convened a conference in 1972 entitled “The Present Interglacial: How and When will it End?”, and reported it in Science magazine. Am I distrustful and cynical when it comes to the motives of politicians? You Betcha! Many thanks to all who have commented on this surely heartening news that the IPCC is no longer predicting climate doom arising from rapidly rising temperatures in the short to medium term. In the light of the IPCC’s climbdown over its near-term predictions, the notion that we only have x years to Save The Planet becomes visibly nonsensical. I’m grateful to Werner Brozek for pointing out a typo: the IPCC’s prediction is for 0.3-0.7 K warming over the next 30 years, not 0.4-0.7 K.
The trolls are on the back foot on this one. Their arguments are more than usually dopey. For instance, the furtively pseudonymous “Billmelater” presents the news that the IPCC is “still expecting an increasing temperature” as though that were some kind of knock-down argument against the fact that the IPCC has now admitted that the “increasing temperature” range it predicts is smaller than it has predicted before. “Billmelater” also asks whether I think everything in a draft document should appear in the final report. Nothing in the head posting suggested that I thought any such thing. However, given that the IPCC has in fact dumped the models and substituted its own supposedly “expert” judgment, with a consequent substantial reduction in its near-term warming predictions compared with previous reports, that fact should have been – but was not – made clear in the Summary for Policymakers. 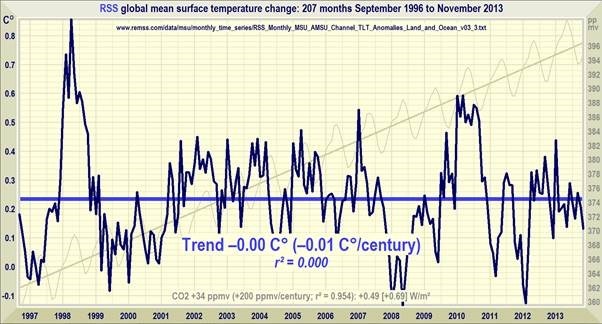 The sneakily pseudonymous “Mib8” asks “Why do all the graphs seem to show some global warming over the last 17-18 years?” On wishes trolls could read – or, even if they cannot be expected to be able to read, at least look at the pictures. 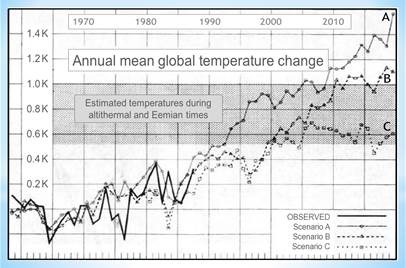 The graph from Remote Sensing Systems Inc. shows no global warming – at all – for 17 years 3 months – a fact that is not only pointed out in words but also illustrated with a graph plainly showing the zero trend line. Richard Betts says my statement that the IPCC has “quietly cut” its near-term global-warming projections is a “totally manufactured criticism”. My only criticism of the IPCC was that it was furtive and that it is a misconceived body. The central points of the head posting, as all of the trolls no doubt realized, are to show that the IPCC is no longer confident in the ability of the models accurately to predict near-term warming, and that it has greatly reduced its predictions of near-term warming compared with earlier reports, and that even its latest predictions are well above observed reality. Of course these points are a huge embarrassment to those who have profiteered by telling us we’re all doomed, and of course the trolls will do their best to undermine these points by deliberately misunderstanding them. But the facts are the facts, and the trolls – if they are any better at math than they are at reading and at looking at graphs – will be able to verify the facts from the detailed list of references provided at the end of the posting. Gail Combs, I fear you are right – I would not be classified as human by the Gurdaian editorial staff. I guess that’s why my right to free speech is taken away. Wonder what is next. As usual, CS Lewis, (That Hideous Strength), got there first. A highly recommended read, although I’m sure you have done. On the contrary, the IPCC previously made clear the substantial uncertainty in projections of near-term warming (as with long-term warming). As this figure from AR4 shows, the previous projections of warming by 2011-2030 spanned quite a wide range (see the orange curves). The new range of projections in AR5 falls within the wider range of the AR4 projections. The range has been narrowed (with the upper end of previous projections now being less likely) because of (a) more years of observational data becoming available as time goes on, and (b) the recent slowdown in warming. But thanks for taking an interest – Happy New Year to you. Previous post should have said 2020-2029, not 2011-2030. I can’t believe they included Eemian temperatures showing that we are barely into the lower end of the temperatures during that time. Only a climactivist can admit we are colder than the previous interglacial period — during which the biosphere thrived — and claim that the Earth will soon become a barren wasteland as we warm to the exact same levels. At least two attractors — two are readily apparent in the Pliestocene, with the warm phase attractor nearly stable at pre-Pliestocene levels and the cold-phase glacial attractor steadily decreasing in mean temperature. The other pronounced feature of the data is a steady shift of the length of the glacial periods from 22 ky to 26 ky to 100 ky over the last 600 ky or thereabouts. As was already noted above, we are in one of the two longest interglacials evident in at least the recent record at a point that could reasonably be expected to be the end of it — or not. The LIA was, or should have been, rather terrifying as global temperatures reached the lowest levels they have been across the entire Holocene post Younger Dryas, level that could easily have been critically unstable to the cold phase transition. Near critical points in open bistable/multistable dynamical systems, fluctuations often grow. The system has two (or more) states that are both consistent with the given energy flow, and random factors constantly nucleate small domains with the structure appropriate to the opposite phase. Far from criticality, those fluctuations are quickly damped. Near criticality, the feedbacks start to favor their growth rather than their decay and the behavior of the system becomes much broader, with larger oscillatory trajectories around an increasingly unstable attractor. This is what “tipping point” arguments are all about — sometimes there are gross feedbacks (such as ice albedo and latent heat) that one can imagine having a point of no return — if enough ice melts, if glaciers and permafrost retreat enough during the summer, then the lowered albedo ensures that it won’t get cold enough to refreeze into glaciers/permafrost anew come winter (at least on the boundaries) and glaciers shrink irreversibly. Or the other way — we have a very cold winter with excessive snow and ice, and all of that snow both takes time to melt and reflects away a lot of spring heat, prolonging the winter and lowering the net heat uptake for the year. The next winter is even colder, snowier, and longer, and spring/summer cooling even less effective, and we tip towards glaciation. The problem with such arguments is that they are vastly oversimplified — they attempt to predict the behavior of a complex system on the basis of an heuristic applied to one or two projective dimensions. They fail to explain why any given year is unusually cold and snowy (or not) in the first place, and besides, the system is manifestly approximately stable almost all of the time because we do not tip over into glaciation any time there is a particularly cold winter, or tip over into melted ice caps and eternal springtime any time we have years, or even decades, of excessive warmth. The shortest relevant timescales of secular variation appear to be decades, and the relevant timescale for true movement of the climate appears to be at least a century. I’ve said it before, and I’ll say it again. Until we have models that can quantitatively — not qualitatively in some reduced dimensionality, but quantitatively — explain the full Pliestocene, and (further refined) quantitatively explain the climate variation over the Holocene, we will not have a clear idea of the baseline for climate variation — what the climate would be in the absence of anthropogenic CO_2. This is a serious question. If the barbarians had overrun Europe at the end of the 17th century (also the end of the coldest stretch of the LIA), so that the Enlightenment never occurred, so that human generated CO_2 never became an issue, what would the global climate be like right now? Is it conceivable that it would have rebounded almost identically to what we have observed even without human “forcing”? Bear in mind that even the models that predict CO_2-based warming indicate that this warming is essentially negligible up until perhaps the 1950’s when the post-WWII industrial boom caused the current relatively rapid rise. The warming from 1950 to 2000 is almost identical to the warming observed from 1900 to 1950 (so much so that one has to be pretty knowledgeable in order to be able to even identify which is which without a legend or caption to help if they are presented on the same scale side by side). In the meantime, something caused the Little Ice Age. It was a real, global phenomenon. It was not aerosols, not carbon dioxide or its lack. It was in some ways a continuation of the general cooling that has been slowly occurring since the Holocene Optimum, but it suggests that that cooling may have proceeded to the point where cold-phase fluctuations are not so strongly suppressed — that one certainly grew, and it has taken centuries for it to shrink back to near “normal” for this point in the Holocene (which is still somewhat cooler than it has been for most of the last 11,000 years). These are not small effects — what is being moved is the climate of the entire planet, over a few decades, from mostly warm to substantially colder, all occurring entirely naturally. The current cooling-to-neutral phase is being accomplished without the help of volcanic aerosols and in the teeth of increasing CO_2. What might we expect if we have a series of 2-3 Pinatubo-scale volcanic events in a decade, or even if one, large, particularly emissive volcano re-awakens and begins a decade-long eruption? We don’t really have much evidence for a still warmer-phase tipping point in the climate record with the current configuration of oceans and continents — the last time the climate was substantially warmer than the Holocene even back before the beginning of the Pliestocene was when the continents and oceans had an entire different topology and connectivity, in particular a channel between North and South America. It is hypothesized on the basis of a perceived stability to a warm phase planet with Antarctica and Greenland fully melted, so that negative albedo feedback is maximally achieved. But is that truly stable? In the historical past, it hasn’t been. Even when Antarctica was indeed fully melted in the summers and supported a rich array of life, it wasn’t horribly stable and eventually it froze never to thaw again. We do not, really, have a clear idea of what the stable attractors are even out there in this extreme regime, and we have no idea what the barriers are between the current climate state and any domain where those attractors become dominant. Many egregious statements are made that are based on e.g. the melting of the Greenland icepack, kilometers thick, in only a few decades, or the melting of the land based Antarctic glaciers at a time when Antarctic ice appears to be growing. I truly do think that climate science is a worthy endeavor for the human race. We have benefited tremendously from our ability to predict the weather in the short run and the climate (within reason) on a slightly longer run. However, predicting the climate on a century scale without the complication of CO_2 is currently beyond us. We cannot even explain the climate of the last few centuries (without CO_2) and have no particularly good reason to think that we could accurately predict what the climate would have been without anthropogenic CO_2. The historical record is rife with century-scale degree-scale changes in global temperature. If one computes the root-mean slope of global temperature in most of the proxies — essentially the average slope positive OR negative of the temperature — I suspect that it would be order of 0.5-1.0 C — decades where the average temperature changes by at least 0.05 C almost certainly outnumber decades where it does not, and the climate usually appears to have a longer term trend up or down over still longer time scales. This is a lower bound for the natural variability of the climate, and is clearly of the same order as all of the warming correctly or falsely attributed to human activity. There is a serious problem with signal to noise here. It will be decades before the AGW hypothesis is quantitatively settled, simply because it will take decades for any “warming signal” to emerge from the natural noise, and it will even then require a lot of sophisticated analysis to separate the two in a fully coupled chaotic system with a substantial innate trend that might well swamp both signal and noise in movements so grand that the entire human race is helpless before them (such as a return to glacial conditions). Human civilization has risen from “nothing” but scattered tribes of hunter-gatherers over the Holocene interglacial. We may — I say may — have learned enough to survive the next glaciation, although probably with a vastly reduced global population, decimated by wars and famine and the return of energy poverty. Hansen’s 5 meter SLR and the end of the Pliestocene is equally scary, actually, although I have to say that I’d rather live in a warm, wet world than in a glacial interval when times are hardest everywhere and ice a kilometer thick stretches down to Pennsylvania in North America and covers most of Europe and northern Asia where currently some billion or two people live (given a choice of catastrophes). However, we do not have such a choice. We do not understand the climate well enough to predict it with anything like real confidence, and it will almost certainly require decades of work on the part of a scientific community not infected with uncharacteristic hubris to get to where we can. In the meantime, technology will continue its advance. The energy sources of today will eventually be abandoned simply because they aren’t sustainable on a millennial scale (some of them not even on a century scale). Carbon based energy was never more than a bootstrap resource, a readily available resource sufficient to permit the rapid advance of civilization and human knowledge to where we can do better, with fuel resources that can last indefinitely. It would be lovely to get through that transition with lots of unexploited carbon left in the ground, so that if humans are wiped out by a pandemic or if civilization collapses in a global nuclear war upon the advent of the next glacial era, there is something easy to mine and burn to bootstrap a second attempt. I applaud the desire to develop solar energy, fission based energy, fusion based energy, satellite based energy into viable sustainable resources even as I deplore any effort to force the issue and adopt them before the technologies are mature and cost-efficient. It’s funny. For most of the course of human history, religions of all sorts predict apocalyptic events that will end “the age” of the day, the current Yuga. Even without science, religions recognize the essential impermanence of things, the changing nature of Nature. The apocalypses they predict — nay, “prophecy” — are absurd, of course. There is no secret knowledge of divine inspiration that can lead us to accurately predict the future, and plain old mundane observationally founded knowledge of things such as physics, chemistry, geology, and astronomy have a pretty hard time extrapolating the global ecology a single decade into the future let alone a century. As noted above, it is easy to find or hypothesize “apocalyptic” catastrophes in nature with or without human help — glaciation, desertification, collapse of the global ecosystem, pollution of the oceans, nuclear war, asteroid collisions, gamma ray bursts. Some of these we can clearly influence. Some them, if they occur, are just plain bad luck for the human race. So long, human Charlie. Better luck next Yuga. As was the case with the religious “catastrophes”, the unscrupulous are quick to seize on any possibility of disaster and exploit it to their own profit, or use it to advance a privately help political position by basically lying to people, playing on their fears. That’s what the quotes up above reveal — a substantial amount of the CAGW noise is just the deliberate attempt to exaggerat the the quality and certainty of the science in order to achieve a political end through deception. The end, it is presumed, justifies the means. Thus always does the priesthood justify its actions — without this myth, without believing this lie, people won’t do what they “should” do or would choose to do if, like me (they believe), they were in full possession of the facts. Time to replay the Feynman Cargo Cult lecture. There is absolutely no substitute for honesty in science, and there is something ethically reprehensible about any scientist who would deliberately overstate the scientific case for some belief in order to attain their own desired political ends. I find your criticism of Monckton’s rhetoric both logical and reasonably established, but only when ignoring a faulty premise at the base of your reasoning. Your problematic premise is that the IPCC has an unbiased epistemological structure with neutral processes and built in self-correction mechanisms to yield objective balance. It is not. It is a subjectively contrived entity for using a new concept of science to support a non-scientific ‘a priori’ conclusion. Its new concept of science is based on ideas having primacy over observations instead of observations having primacy over ideas. Thus the AR progression you discuss is the non-rational product of built-in subjectivity, scientifically speaking. A demarcation of IPCC endorsed research from objectively evaluated research is now known sufficiently for minimizing the IPCC’s merit in the evolution of future climate science dialog. Also, Happy New Year to the IPCC Bureau. Mr. Whitman flatters me by describing my surely businesslike and scientific head posting as “rhetoric”, and says he cannot fault Mr. Betts’ criticism of my “rhetoric”. However, I had made the simple, straightforward point that the IPCC’s current interval of projections is lower than it was in the second draft of its latest report. Neither in the second draft nor in any previous report had the IPCC projected, as its central case, as little as 0.4 K global warming over 30 years. No amount of wriggling by Mr. Betts will alter that fact. 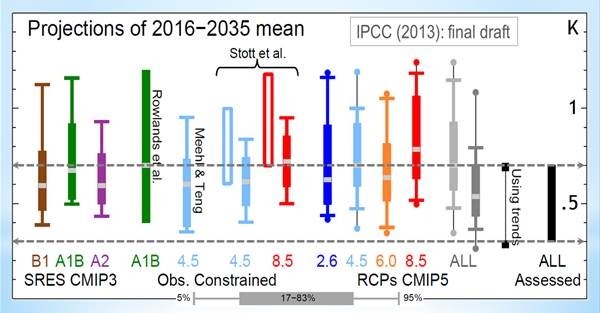 It is also entirely plain from the very clear diagrams in the head posting that the IPCC’s current interval of projections is very much at the low end of the models’ projections. It is the first time the IPCC has substituted its “expert judgment” for the electronic crystal-gazing of the models. Professor Brown points out, rightly, that the rate of global warming from 1900-1950 is almost indistinguishable from that of 1950-2000. In the earlier period, the models would not have predicted much global warming (probably as little as 0.1 K). Yet that period warmed almost as fast as the later period, when we could in theory have had some measurable influence on the climate. His final sentence about the immorality of scientists deriving their results from political belief rather than the other way about is well put. Thank you Dr. Brown for clarifying that. We need to understand the real questions and variables in climate. Not focus on just one possibility. Let’s face, it the Holocene has been incredibly ‘even tempered’ compared to other interglacials. Also like you I want to see other energy sources (Thorium?) brought on board. As a chemist, burning the feed stock for many chemical processes makes me cringe. I met Victor and Marjory Paschkis in ~1970 in Kingston Ontario. They were impressive people who had a significant influence on my life. Victor and Marjory invited us to visit them at Fellowship Farm in Pottstown, Pa. Events intervened and we never made the trip. Marjory died in 1983 and Victor in 1991. In 1986, the American Association for the Advancement of Science gave Dr. Paschkis its Scientific Freedom and Responsibility Award for his “pioneering efforts to establish the principle that scientists and engineers have a personal responsibility for the social consequences of their professional activity.” In the same year the American Society of Mechanical Engineers gave him its Founders Award. The relevance to this thread is that the warmist camp has, I believe, failed to adhere to basic ethics in their fanatical promotion of global warming alarmism. They have squandered over a trillion dollars of scarce global resources based on nonsensical global warming catastrophism that we knew was false more than a decade ago. Now the warmist camp is climbing down from their very-scary global warming predictions one degree C at a time, in the hopes that nobody will notice they are abandoning ship. That’s a point that isn’t made often enough. There are some human activities that we will probably look back on and say: Gawd, how stupid were we to do thus and such. Decimating the genetic diversity of the planet is one big oops, as it looks like genes are a natural resource of enormous value. Decimating the feedstock for organic chemistry by burning it is another one that doesn’t receive nearly enough attention. It would be LOVELY to find a cost-effective alternative to gasoline and fuel oils simply because oil is the cost-effective basis of everything from drugs to plastics, to the point where burning it to heat a house seems really stupid. Sadly, the very highly energetic chemical bonds that make it valuable as a starting point (because it is expensive to create them the hard way, starting from carbon and hydrogen) also give it an enormous energy density and make it a nearly uniquely useful fuel for automotive devices. But that doesn’t justify creating an artificial global panic to try to keep people from burning oil to serve the “greater good” of preserving a valuable resource for other uses. It might well justify an rational public conversation on the importance of investing in (research into) reasonable alternatives. Apparently the rhetoric of yours that I refered to (in my comment Richard Betts) was ‘furtively’ expressed by me. The subject rhetoric of yours being discussed is your ‘furtive’ / ‘sneaky’ verbiage wrt the change found in the IPCC’s final AR5 document. @ Eric Simpson (re: 11:34pm yesterday) — Sounds good! Yes the video, too — I watched that excellent video thanks to YOUR name-link. And, thank you so much for the kind words. Hi, Gail (congratulations, heh, heh — seriously, YOU always write excellent posts (and they are always on-topic, too, lol), thank you for all your super-great research on behalf of the truth!) — thanks for the wonderful collection of quotes above (and for all the super-great research you share in succeeding posts). That is exactly what we WUWTers need to get the facts out there and to expose the corruption of the climate “scientists.” THANKS! The Society of Misplaced Thermometers (Stephen Richards, 1:50am today) LOL. And right on about minutes of meetings. Wouldn’t THAT be a great comedy skit! @ Geir (1:55am, today) — Thanks for the insightful report from Norway. Hang in there, buddy! “Lies, damned lies and the IPCC.” (Roy UK, 2:53am, today). Good one! @ Ken Hall — excellent point about what information people rely on when their own money is on the line. “If Rodin did this with his sculpting the Thinker would be transgendered by now.” (M Courtney 3:57am, today). Applause, applause. (and, yes, C. S. Lewis’s (an author who is ALWAYS a good read), That Hideous Strength is marvelous (wonder if the Cult of Climastrology has a Head (ugh)?). @ Richard Courtney — glad you are okay (hope your friend, Sue, is, too). My grandfather told me about this fellow that would come around during dry spells in the late 1800s he was called the rainmaker and tried to collect money to cause it to rain. He was called the rainmaker the people that paid him were called fools you cannot control the weather but if you want to pay feel free. I think this gentle man also sold snake oil its been around for a long long time. Excellent as usual, except in the final graph “OBSERVATIONS” should be labeled “Linear Projections Based Upon Observations from Through ”, or far shorter “Projections from Observations”. Obviously any date beyond 2013 is a projection not an observation, and should be so stated to avoid giving ammunition to quibbling CAGW advocates. Oops! Formatting problem. Should have been “from [date] Through [date]”. Sorry. Decimating the feedstock for organic chemistry by burning it is another one that doesn’t receive nearly enough attention. It would be LOVELY to find a cost-effective alternative to gasoline and fuel oils simply because oil is the cost-effective basis of everything from drugs to plastics, to the point where burning it to heat a house seems really stupid. Only a religious adherence to the fossil fable allows for depletion anxiety. Earth is awash in hydrocarbons. Earth produces hydrocarbons continuously via serpentinisation. Bugs have been eating petroleum for billions of years – bugs were eating petroleum before photosynthesis evolved. Petroleum is a “renewable”. I am the only person to ever mention serpentinisation on this website – ignorance of geochemistry is evidently bliss. Petroleum is abundant and abiotic. It’s time we stopped deceiving ourselves about its origin. Clearly if three values are used to ‘bracket’ a range, it follows that the the first and last will be at the extremes rather than the most likely, no? What is the source of the assertion that Hansen predicted a 1C rise every two decades in his 1988 testimony? 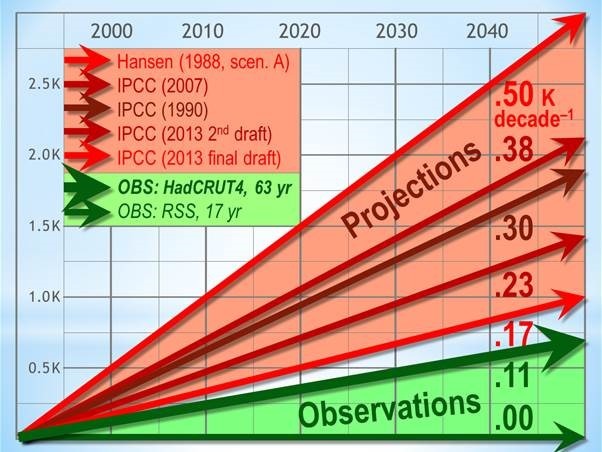 Now 9F is 5C so Hansen appears to have been predicting a range 1988-2050 of between 0.2 to 0.8C per decade. What is the source for the idea that he actually predicted a single number? I would love this to be true. I don’t know why it isn’t. But it does seem that it isn’t. Geological surveys that have looked for oil near serpentine or similar marble-like geology have not led to commercial finds. Maybe biological oil is formed in far more accessible places than inorganic oil? If so, then oil is still running out with current technology. Maybe the chemistry is wrong and Serpentisation doesn’t happen (I can’t see that but I may be wrong). Seemingly, it isn’t seemingly formed near the surface, though. And why should I doubt empirical evidence? It does seem like all usable oil is biogenic. PJ Clarke, you are trying to defend the indefensible. As head of GISS, James Hansen unethically manipulated the temperature record to show lower past temperatures, and higher current temperatures. The result was to show a [false] rapidly increasing rate of global temperatures. Hansen’s “adjusted” record always went in the same direction: lower past T and higher present T. See here and here and here. Honesty matters. You need to pick your heroes a little more carefully. I was waiting for this – we are seeing the white flag being waved by the UN, with a hedge. Of course in 30 years it’s going to warm up, after the cooler period that’s already started that will last another, guess what, 30 years or so. This is the closest thing to a complete face-saving surrender by the UN IPCC. Good job skeptics everywhere around the world for being on the job for all this time pointing out the obvious, dissecting the difficult, and repudiating false claims. It’ll dawn on the rest of the warmists soon enough that it is solar cycle 24 and a rag-tag barely affiliated minority of true climate realists that kicked their collective arses. Let’s just hope the MSM and US government doesn’t try to continue to buffalo and badger any more about climate change or CAGW. If they do, I am positive my fellow skeptics will keep up the good work. Let’s just see what they try to pull on us now this year politically as they prepare to fleece us again for something that isn’t and could never be our fault. I’m ready. Are you? How the hell can anyone still try to portray all this as a crisis? Thanks for the link and new word. I was aware of the abiotic oil hypothesis which has been discussed here before. What’s really staggering is that if the climate hadn’t cooled, the warmists would use this to claim they were right. Many Leftists don’t understand why they would still be wrong even if the temperature had gone up the last 17 years. Lord Monckton and RGB in the same thread, only two days into the new year! What a great start to 2014! Follow the money.. Simple as that! I Don’t know about the others but I recognised this as being a “myth” when I spotted it. What he actually said was…. Says nothing about “announcing” (read forecasting??) – It says “we’ll have to have”. That is, one will need to happen and NOT that we’ll have to forecast one. I suspect that (like me) he is fully aware of human nature and realises that “people” generally need a sharp reminder of reality (I don’t mean it will be a reality BTW), in order to bring any problem to forefront of their minds. A bit of warming on the other hand? Not so much. Thank you, Lord Monckton, for your hard work and dedication. First, I absolutely agree … but what they have actually done is to INCREASE the burden on Skeptics to prove that the models are wrong. For the past five years, Skeptics have been pounding away at the lack of warming (17 years and counting). Even the governments to whom the IPCC reports have reminded the IPCC crowd that this is a significant variance as compared to AGW model predictions. By flattening out their projections slightly, the IPCC is essentially putting the Skeptics in the position that we now won’t be able to “disprove” their models until we have 50 years (to pick a number) or so of data showing no warming. All the while, they will continue to trumpet “man’s impact on global climate change” while negating the argument that there is proof to the contrary. After all, they are not debating the issue, so much as they are driving the propaganda/research funding machine. For those who understand this stuff, we get the fact that this is a major concession by the IPCC. However, it might serve us well to view this revision as something of a Trojan Horse; it may look good on the surface, but when they start dismissing the 17 year temp plateau as being well within the parameters of their models, it may become problematic. The real issue, now, should be about holding to account those who knowingly misled the public by falsely claiming the 2007 IPCC’s 4th Assessment Report’s message was gold standard climate science … incontrovertible … settled, and about the appalling treatment of sceptic scientists guilty of only doing what real scientists do i.e. diligently searching for the data that contradicts a theory, in this case the IPCC’s mantra … in accordance with the scientific method. If the IPCC had been a listed corporation, the 2007 climate report would most certainly have been withdrawn by the end of 2010 (following all the many revelations … errors, mistakes, controversies and scandals relating to that report) and the directors would have been charged for engaging in misleading and deceptive conduct. Unless a lesson is learnt from what has happened since 2007, with all the lies, half-truths and scientific malfeasance, all this exaggerated global warming alarmist propaganda will continue in order to achieve what activists and politicians have been trying to achieve for decades, international controls on fossil fuel energy use. Nonsense. The burden of proof has always been and remains on those asserting that human CO2 drives climate. We have nothing to prove. We only point out, day after day after day…, that they have not yet provided ANY evidence for their purely speculative position to prevent their fooling people. We do not do this to disprove them. Reality has done that over and over. We do this to educate the voters to, thereby, prevent the destruction of our economies by the Enviro-profiteers and their stooges in government. Well, ACTUALLY, heh, heh, heh, …. that video turned out to be a great morale booster. You WUWT Science Giants are WINNING! Al “Millions of Degrees” Gore said that over 7 years ago… . The foes of truth will be forever with us, but they are on defense. Bwah, ha, ha, ha, haaaaaaaaaaa! TRUTH PREVAILS OVER L1ES — EVERY TIME. Ah, now, wasn’t that a delight? I could listen to CM’s mind (and that lovely voice) all day. Hm. A good part of the day (smile). Update: RSS for December is now out and the time for a zero slope went up a month to 17 years and 4 months from September 1996 to December 2013. I’m sure this addage is empirically based. It’s an observation. I’m not disagreeing with you that the central estimate of near-term warming was reduced between AR4 and AR5. This is indeed the case, as a result of the slower warming in recent years. My objection, as John Whitman correctly notes, is to your rhetoric. You seem to be attempting to paint a picture of the IPCC somehow surreptitiously “climbing down”, which is simply untrue. This is incorrect, as there was not much confidence in the first place. As I showed with the AR4 figure, the uncertainty range for the previous near-term temperature projections was quite large, and indeed it spanned zero. Yes, a small probability of cooling was judged possible. This is not exactly a sign of high confidence in the ability to predict near-term warming! The IPCC did not have the former confidence that you are claiming. There is no “climb down” – just ongoing developments in science. Incidentally, you described your post as “businesslike and scientific”, but to me it reads as political. There does seem to be a bit of a theme that whenever some aspect of climate science moves in a direction favoured by sceptics (e.g.. observations or models showing/projecting slower warming) then this gets tagged as being “admitted” (you use that word above), or “conceded”, or done “silently” or “quietly”. It’s almost as if some people simply don’t understand the scientific process, and think that it works like a legal or political process with one side pitched against the other. It seems to me that your use of “admitted”, “silently” etc helps you build the narrative of mainstream scientists being your adversaries who are gradually giving way on their position – but this is a false narrative. Science evolves based on evidence, and if the evidence points to slower warming in recent years and in the near future, then fine, that is what the scientific conclusions will be. Forgive my strong reply but this is quite infuriating. There seems to be a misapprehension that climate science evolves based on evidence. That is incorrect. Science evolves based on evidence. Climate science is a closed club that denigrates alternate views. It is a pseudo-science, despite the failed efforts of Richard Betts to restore some credibility to the field. Professor Frame said Lord Monckton was trying to bait scientists into a debate on climate change. Professor Boston confirmed he had been contacted about hosting Lord Monckton at the university, but declined. In science evidence is accepted and the conclusions derived based on the evidence. In pseudo-science like astrology and climatology the conclusion is pre-detemined and evidence chosen that fits. Other evidence is silenced and certainly never debated. It is quite reasonable for a scientist to look down on climatologists for acting surreptitiously. They do as they have to. Otherwise they would need to debate the real evidence – about 17 years so far – which is contrary to the core purpose of the IPCC. Has anyone ever noticed that no other (scientific, not religious) field has copied the formation of an IPCC structure to determine truth? Why is that? The only untruths are yours. Viscount Monckton’s above article concerns changes between the IPCC AR5 SPM and the AR5 so-called ‘science’ report. Your attempt to pretend the article is about changes between the AR4 and AR5 is a ‘red herring’ which can only be understood to be extreme trolling. But in the final draft it quietly cut the 30-year projection to 0.3-0.7 Cº, saying the warming is more likely to be at the lower end of the range [equivalent to about 0.4 Cº over 30 years]. That is simply true, and your sophistry does not – and cannot – alter it. Importantly, the “rhetoric” of Viscount Monckton is correct. The IPCC has “climbed down” and has provided the “climb down” in a manner which is not only “surreptitious” but is also in flagrant contradiction of the IPCC’s own agreed and formally adopted procedures. I explained this above in my refutation of the similar nonsense to that which you present when it was provided by Billmelater. This link jumps to my explanation. Thank you Dr. Brown for your very astute comments on both the need to understand natural variability before we can meaningfully predict future climate, and also your statements regarding the desirability of not burning through our fossil fuels so rashly. Reading your comments on a thread like this is like finding a treasure in a junk store. re your post at January 3, 2014 at 8:49 am. Yes, Robert Brown does make good comments and has made some in this thread. But that is not why I am writing this post. Say what!? “A junk store”? We are only in the first week of January and your post may turn out to be the best piece of concern trolling during the entire year. Congratulations. OK Richard, now I am looking at you. It is also true that the most difficult place to recognize junk is in your own closet. I agree that the subject ‘furtive’ rhetoric by Monckton about the AR5 process has little merit . . . but on the other hand the IPCC’s inherently subjective behavior that serves to support biased assessments is, in my view, the thrust of what is being implied by Monckton even without his rhetoric. If I am correct that it is his implication then I support Monckton. FYI => In this thread and in my frequent comments on this venue for the past several years I have maintained that the IPCC has implemented a new concept of science which is subservient to the promotion of mere preconceived ‘a priori’ ideas. On a personal note: I admire your calm measured demeanor in the dialog on this thread. It adds a good dimension. Thanks. I am replying to your “junk” at January 3, 2014 at 12:56 pm. This is a link to my entire post which you attempt to vilify. I am content for people to click the link and to read what I wrote. They will see I linked to and quoted the IPCC’s own documents. If that is “junk” then complain to the IPCC, not me. You trolls swarm to any thread which presents indisputable facts you don’t like. It is because the truth hurts warmunists. If the IPPC’s previous predictions were so wrong, what reason is there not to expect that their most recent predictions aren’t also wrong? Did they predict that there would be no warming in the last 17 years? No, they missed that one too. Gosh, Richard, for a self-appointed comment cop, you seem to not be paying much attention. I am a CAGW skeptic who has been making primarily scientific comments here for a number of years. What I don’t share is the political views of folks like you and Monckton, nor will you find many examples of me using schoolyard taunts like “warmunist” or “troll.” In fact I am living proof that it is possible to be a CAGW skeptic and still believe that sustainability is a moral imperative, a viewpoint that is eloquently elucidated by Dr. Brown above. Thank you for expressing those views. On this wonderful venue, I am often disappointed with the righteous troll accusations by a few self-appointed vigilantes whose demeanor toward those with differing views tends to suppress the spirit of open dialog here. Re: sustainability => I think the topic of sustainability initially expressed on this thread by rgbatduke (on January 2, 2014 at 11:03 am) needs a lot more precision of definition and full expansion wrt free individual volunteerism versus authoritarianism . . . and it must venture more clearly into the very fundamental basis necessary for any valid economic calculation and ownership. In other words it needs very open dialog without troll namecalling. I see you are still trolling at January 4, 2014 at 8:05 am. Viscount Monckton and I have very, very different political views. And that has NOTHING to do with why each of us promotes good science and opposes the AGW-scare. You called everything which does not concur with your views “junk”, and when I called you on it you misrepresented a post I had made. re your ridiculous post at January 4, 2014 at 9:51 am. Each and every post from Matt Skaggs has been a troll comment. I am not “disappointed”, I am outraged that you would cl;aim support for this site while supporting trolling. If you really support “this wonderful venue” then have the guts to support the presentation of all views while opposing trolls whose purpose is to prevent debate. I just love it when GOD makes a fool out of the elitist morons. Disagreement on the most fundamental of concepts is the essence of the most important knowledge dialogs. We can burn away all irrelevancies in that crucible. Troll accusations are detrimental to that. I am replying to your questions concerning my objections your sophistry which you present in your ridiculous post at January 4, 2014 at 7:24 pm. An example of such trolling is your implication that I am afraid of you and/or Matt Scaggs’ nonsense. Trolls attempt to prevent discussion of a subject by using a variety of methods to deflect the discussion onto something else. That is a wide subject which encompasses the IPCC, IPCC Procedures, IPCC global warming predictions in the AR5, the “slashing” of those predictions, reasons for and justification of the “slashing”, and the “silent” manner of the slashing. NOT about Matt Scaggs erroneous assertions of my and Lord Monckton’s politics. If you want discuss matters other than the subject of this thread then find a thread which discusses those other matters or establish your own blog for the discussion. Frankly, I don’t think there would be much traffic on a blog established for presentation of your narcissism. For myself, I will continue to support rational discourse and, therefore, I will continue to oppose trolls. The subject troll accusation(s) is (are) name-calling. It is invalid logically and is not appropriate in basic intellectual discourse. Personally, I am surprised it is occurring on this venue. I am writing as a courtesy to let you know that that I read your daft post at January 5, 2014 at 10:21 am. If you were to answer my post at January 4, 2014 at 10:05 pm then I would address your answer. But I shall ignore any further posts from you similar to that which I am replying: I have better things to do than waste time responding to idiocy. Too many lies for even this to be believed. In reply to your latest comment to me, my above quoted previous comment to you remains relevant. You persist, even in your most recent comment to me, to defend chronic name-calling and in doing so to keep on insulting. Who here on this thread has treated you that way? I do not recall anyone doing so. I would like to know who here on this venue has historically ever treated you that way?